The Raspberry Pi computer was inspired by the machines of the 80s, which were used interchangeably for programming and gaming. In fact, many of you will remember typing in the pages of code from a magazine to make a game. Some people used them as a basis on which to build their own games, taking the early steps into what has become an important industry. 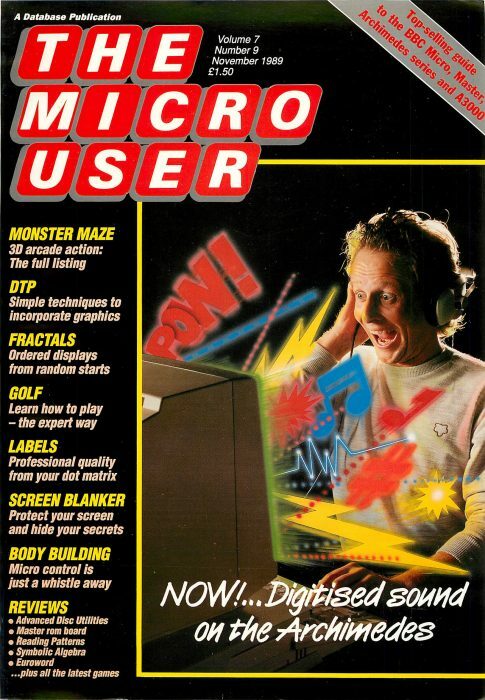 In the 1980s, Micro User magazine was an important part of the early computing education of a lot of people who now work at Raspberry Pi. Mike Cook, who now writes for our official magazine, The MagPi, was author of the monthly Body Building hardware feature. Nowadays, computer games are a crucial part of our cultural history. We see this in the enthusiasm for retro games projects that people create with our computers. A trip down 8-bit memory lane is a lot of fun, but there’s a serious side to the preservation of games too. The games and machines that inspired a generation of digital creatives are old and obsolete. There will soon come a time when they no longer work; a lot of work is done by organisations like the Centre for Computing History in Cambridge to preserve old hardware, but it’s an uphill battle against the moulds that find the medium inside floppy discs so attractive, the leakage of electrolytic capacitors, tin whiskers developing in solder, and a million and one other sorts of entropy. In the future, there could be no way to revisit this part of our culture in the same way we can with books and objects without the work of archivists and historians. The cultural side of games is clear in the way they represent real places. The Museum of London are exploring this with an exhibit of representations of London in games. The earliest example is in 1982 text-based adventure game Streets of London for the ZX Spectrum; more recent ones include Tomb Raider III and Broken Sword. You can’t understand a game by looking at it in a museum case: it has to be experienced. 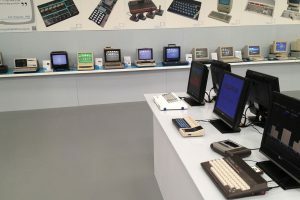 The museum collection includes ZX Spectrum and Commodore 64 machines, but the curators found that these old computers were not robust enough for ‘hands-on’ exhibits. Long load times from cassettes, 30-year-old worn keyboards and obsolete monitor connections all hampered their efforts. Step up the Raspberry Pi, and the resources for retro gaming provided by RetroPie and the many emulators it supports. This seems appropriate, given that the Pi is the inheritor of the DIY ethos of these early games machines. All the interactive exhibits are powered by Raspberry Pis, emulating Spectrums, Commodore 64s, and even a Windows 95 PC. What’s on-screen is only part of the experience, so the exhibits also have authentic input devices. 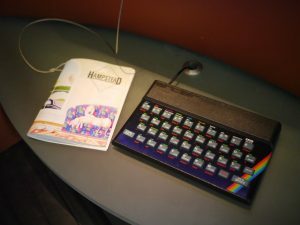 Adventure game commands are typed (and mis-typed) into the squashy rubber-membrane keys of an adapted Spectrum keyboard. Platform antics are controlled with a C64-like joystick (instinctive flailing of the controller to make characters jump higher is optional). Even the original manuals are included, as referring to them was so often an important part of the experience. As custodians of cultural history, it’s also important that the museum uses the right processes to preserve the games. They have acquired copies of games on the original cassettes and disks, and carefully transferred them to modern media. This is important for copyright, to ensure the authenticity of the code, and for the completeness of the collection. It’s easy to forget that games are important historical artefacts. They tell us about past experiences, and the way they represent places and events is a part of our cultural history. Although digital artefacts are quickly obsolete, people are going to great lengths to develop ways of preserving them for generations to come. Seeing representations of London in video games alongside the art, objects and literature in the collection at the Museum of London shows just how much a part of life digital objects are now. 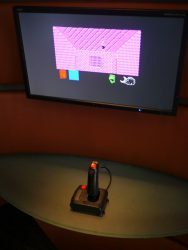 It also shows how the history of the early video games era is being passed on through the Raspberry Pi. It’s not just inspiring a new generation of digital creatives. It’s also helping us all to remember and understand our digital heritage. London in Video Games is on display at The Museum of London until the end of April, and the museum plans to continue to explore digital preservation and games emulation. We know there are lots of people in our community with expertise in emulation and archiving of retro games: let us know in the comments if you might be able to lend your expertise to projects like this. Very nice. I’ve just completed a ‘ZX Raspberry’ project (details at mrpjevans.com) for these very reasons. I have a modest Spectrum collection of both hardware and software but tend to use emulation to preserve these 30 year old tapes and machines. This is in contrast to The National Museum of Computer, where I am curator of the Sinclair collection, which operates a ‘real thing’ policy. I guess there may come a time where that may need to be re-evaluated but I agree that preservation of hardware and software are different things. Always happy to lend my assistance to such projects should it be useful. Thanks. Both are different but both important I think. The Museum of London focuses on cultural history so the experience and the way things are represented in the games is the main focus, whereas when looking at technological history I agree it’s important to preserve the real things too. On that note I am ashamed to admit I’ve not been to your museum yet, I’d love to visit soon. Have a microdrive in you collection ? I still have one. No media, no interface, just the drive. I modified it with a db15 connector on the back for reasons i don’t remember …. I have such fond memories of those early days of home computers. 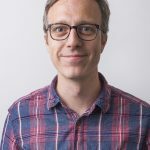 I bought a C64 in 1983 and moved to the Amiga in 1989 and stuck with it until 1999 when I finally gave up hope for a new machine and moved on to Linux. I still have several hundred floppy disks from that Era and a lot if still functional hardware. Funny to realize my $35 Pi 3 will emulate them so well. Where could we get the games? I was wondering why there was no mention of emulating a BBC Micro but then I remembered that beebs are so reliable that they are probably still use the original hardware! 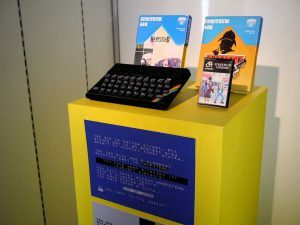 The main focus of this exhibition was representations of London in video games, so I guess the museum hasn’t yet found any BBC Micro games that depict London. If you know any let me know and I’ll pass it on to their curator. Sad part is, there are some companies that buy the rights to this stuff and sit on it. Then it’s even illegal to archive copies, unless you can use it in the original format on the original hardware. All on the off chance that there is some way they could make some money off a derivative product sometime in the future. The original binary in the original format should be open for public noncommercial use in any way that can be used to archive and showcase the original work in a historical or archival format (aka library/museum/private collection or display). At least after 20 years, especially if it is not being made available for public purchase. That’s entirely different with the Amstrad stuff. My brother (with some help from Amstrad’s legal dept.) pushed all of the materials Amstrad owned into the public domain. Please give your brother a hearty pat on the back and warm hug from all of us. That’s brilliant. Ok with Spectrum – is there anything QL? Years ago there was a type-in Stellaris, and I can’t find it any more (probably on a mdv). Sad, I remember having OCRed it. I have 2 QLs, with manuals, a dual-floppy setup, the “office” suite on floppy, and a few magazines (sadly not the Stellaris issue). Don’t even know if they work, and even then I know one at least has failed keyboard (fragile perished perishing membrane). People have been working on emulating the QL operating system on the PI. There is already an emulator for UNIX, so it would seem possible. Multiple QL emulators already exist for the PC. Very happy to see the Sam Coupe in the top picture. A much under appreciated machine in my opinion, it too had a great community encouraging younger kids to code and develop games. Oh I so wish I could go to this exhibition such a great theme. I run emulators all the time on my PI love it. Scratch performance – feel the speed!